I was just reading about this on Salon.com today. I thought it was interesting although a tad flawed in reasoning. So I wrote a letter to the editor explaining where I think he went wrong. The Salon article is available here and link to my letter to the editor below. First Apple is forced to play the patent game or others will eat their lunch as is currently happening to Google. Google seemed to want to stay out of the patent game but after several court challenges went and bought Motorola undoubtedly for the patents. As for Asian workers and plants there is not a computer company or a light bulb manufacturer that makes a product here. We don't make things in America anymore. Should it change why not it would be good for jobs but probably not good for low cost items like WalMart's bottom line. Are Americans willing to spend a little more for made in America on their consumer electronics? If they were businesses would be more likely to do it. A company can be pro liberal and still make smart business decisions. Look take a look at where companies and individuals make political donations and that offers a lot of insight into their political leanings. Mostly liberal candidates you can bet the person or company leans liberal. Same for conservatives, if they split down the middle they are more interested in how government affects their business than their ideology. Apple owes their success to innovating, to redefining the smartphone and the MP3 player, to building a better OS and sexier computer hardware. They also keeping inline with ideology found ways to make the computers greener using recyclable components and by insisting on better working conditions and pay for the people that make their hardware. When several suicides happened in a short period at the Foxconn plant Apple sent investigators to look into it and see what they could do to help. Overall they are a company that tries to do the right thing and take care of their employees. Note when the earthquake in Japan occurred Apple stepped up to help their employees and families. As to the companies software ecosystem, they make money on sales of apps they also shoulder the cost for bandwidth and credit card processing fees taking that off the shoulders of the small developer allowing smaller companies or individuals to publish apps. The vetting process for apps helps curtail malware from getting on smart phones and by building an integrated ecosystem it helps the end user by making sure things just work together. The Mac is stable because the company controls the hardware and the software. Much to the surprise and amusement to my readers I checked in on FourSquare from the Microsoft Store at the Mall of America stating I went into the store and didn’t burst into flames. For those of you who don’t know me personally but read my writing here and in Apple Spotlight Magazine and listen to the TechBits podcast may not know is that your friendly neighborhood Apple Certified Support Professional and other affiliations is a mild mannered Support Engineer by day supporting both Mac and PC and my alter ego is the MacGuy writer, podcaster, and general Apple fanboy by night. It is sort of like being a super hero without the cape. We have all heard the news about Microsoft’s 11 Retail Stores and the stories about 45 more coming in the next year across the US except for Alaska. 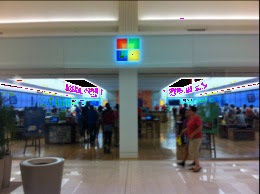 Well, on a recent trip to Minneapolis I decided to visit the Mall of America to visit the Microsoft Store and its arch rival the Apple Store just across the hall. The look of the two stores is very similar downtown the liberal use of white walls and generous lighting and light wood tables. Microsoft does throw in some splashes of orange and video monitors that wrap around the store instead of putting up ad banners. The MS store employees where red shirts to the Apple Store employees use of blue. Apparently the Microsoft Store designers never watched Star Trek. I did notice in the hour I was there no one walked out with any snazzy new Microsoft gear. In fact the employees seemed a tad distant and didn’t talk to me unless I approached them and asked questions. Since Microsoft doesn’t sell much hardware except for the Xbox and keyboards and mice the store is loaded with Sony, Dell, Asus, and a few off brand looking machines. 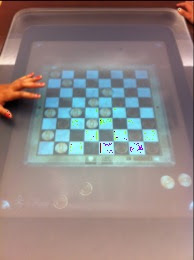 The store was adorned with four Microsoft Surface tables. Not for sale that I could tell and not as impressive in real life as in the videos. Overall it was a poor imitation of the Apple Store experience. Although lots of Xbox’s and Connect systems scattered through the store provided hours of entertainment to kids of all ages. I supposed it is cheaper than the arcade around the corner. A Microsoft store employee who spoke to me on condition on anonymity confided in me when I asked about the striking similarities between themselves and store across the hall stated “We like to take something that obviously works well and improve upon it.” Later in our conversation this employee pointed out something missing from the Microsoft Windows 7 computers stating the “Microsoft makes a deal with all vendors that put hardware in our stores. No bloatware is allowed on these computers. These machines only have Microsoft Windows software on them and Microsoft security software nothing extra.” I will note one of the Asus tablets that converts into a laptop they were showing did feel very sluggish when using it and the similar tablet right next to it for a few hundred more was a much better performer. Even in the Microsoft store they allowed under powered hardware in that makes their software look bad. Incidentally that under powered hardware was still more expensive than a Macbook Air which is much faster and more usable. Nothing in the Microsoft store I looked at came close to the usability of the iPad, the elegance and speed of a MacBook Air and notably missing from the line up of tables of gear was a selection of Windows Phones. Maybe I missed that section of the store. There was a large window display reminiscent of the iPhone displays with a LCD monitor turned on its side showing video of what an iPhone can do. They had the Microsoft version in the front window of the store but I never noticed phones out to be touched or used. Also conspicuously missing was MP3 players. I guess Microsoft figures those will never catch on. Finally putting the Microsoft store across the isle from an Apple Store and this was not an accident all of the 11 Microsoft Stores are in close proximity to an Apple Store. Just seems to highlight the deficiencies in Microsoft’s strategy. The one winning product they have the XBox is relegated to the back of the store and looks more like an arcade than a retail store. The employees aren’t engaged and don’t feel like they really believe in what they are doing. It seems as though Microsoft thinks if they make themselves look like the Apple Store that one of two things might happen. Either one they will confuse would be consumers into walking into the Microsoft Store instead of the Apple Store and selling them a computer. Or two if they make themselves look as much like Apple as possible somehow that will make them magically hip and competition for Apple. The problem is the PC industry engaged in a race to the bottom on price and innovation suffered. Since Microsoft doesn’t control the hardware at all it makes it impossible for them to move in the direction they want to go. Apple can and does tie the hardware and the software together tightly to make a great experience. Something Microsoft does not have enough control over their vendors to accomplish. In short after spending time their I have to agree with an analysis of the Microsoft Store by John C. Dvorak the Microsoft store is not a good idea. It seems as though Apple is the only one who has figured out how to make the experience work. Did any of you ever visit a Gateway Country Store? There is something going on in Apple that isn’t easily duplicated. Like typing the hardware and software together to create an experience the Apple Stores are more than just the decor, the computers, and the staff. There is something very carefully planned a secret sauce that has made these stores wildly successful in a way no other PC manufacturer has been able to duplicate. When the Apple Stores first opened It was universally accepted they would suffer the same fate as Gateway Country. However they have grown and flourished into one of the most profitable retail spaces on a per square foot basis. It is amazing. For those wondering when I left the Microsoft Store I did walk straight over to the Apple Store to get a refill of that upbeat Apple energy and the force was in balance and all was right with the world again. Recently the following article was posted on my companies web page. Visit http://www.augustjackson.com/our-space to read this article and the musings of my other co-workers and check out our companies new web site, it is really stunning! Like other programs such as Teach for America or Americorps Code for America is a way for Technologists, and other IT people to give back using our unique talents to help governments be more efficient and connected with its citizens. By pairing city governments with technology people to develop scalable solutions to improve government transparency and communication, replace outdated technology with modern Web 2.0 technology. Code for America is working to create open source software repositories so governments can share code and solutions to help them integrate platforms, reduce costs, and eliminate redundancy. Geeks like to solve problems and create new software. So using those talents to serve the community is away for another group of Americans to give back to the community. Government has been historically slow to change and adopt new technology that businesses have used for years to remain competitive. Code for America gives city governments a chance to catchup with larger organizations with bigger budgets and more human resources without having to spend the money. Currently the city of Chicago is a finalist for the 2012 Code For America Fellowship to update the 311 system in Chicago. Making it more than just a phone based service to contact city government services. Open311 will extend the existing 311 service to the web and allow citizens to contact government services and track status updates through the web and smartphones. Freedom Speaks LLC has created a program called City 311 that runs on Windows Phones, Android, iOS, and Blackberry and the web. Allowing participating city governments to receive reports from citizens for graffiti removal, report potholes, request bulky trash pickup, report illegal dumping, street light outages, or virtually anything else that might need to be reported to a city government. Allowing this to be done electronically of course makes it more efficient since someone isn’t required to be on the phone to take the report. The appropriate department can get the dispatch right away and the citizen can get feedback on the status of the report. Making us all just a little more connected. Check out Code For America at www.codeforameica.com or take a look at the City 311 app on your smartphone or www.citysourced.com.